The newly elected president of South Korea, Moon Jae-in, has been sworn in after a decisive election victory. He said he would be willing to visit Pyongyang "in the right circumstances". The 64-year-old human rights lawyer, known for his liberal views, wants to increase contact with North Korea in a departure from current policy. He has also vowed to unify a divided country reeling from a corruption scandal which saw his predecessor impeached, and improve the economy. 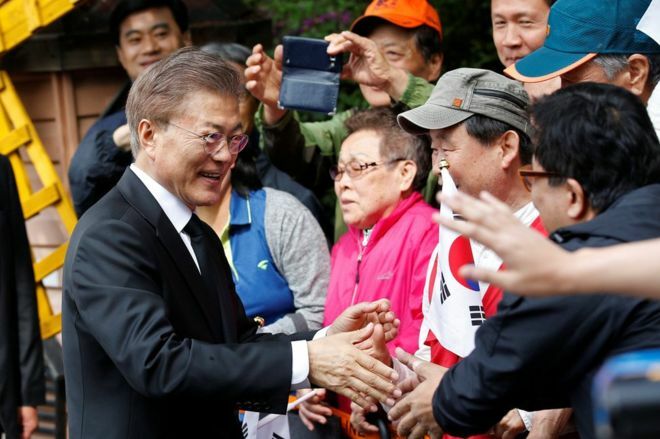 Mr Moon was sworn in as South Korea's 19th president at the National Assembly building in Seoul, filling a leadership vacuum in the wake of Park Geun-hye's removal. The Democratic Party candidate has positioned himself as the man who can move the country on from the scandal, and has pledged to build "a just, united country". He has also been critical of the two previous conservative administrations for failing to stop North Korea's weapons development, and has promised to bolster the economy and address youth unemployment, key concerns for voters. The son of refugees from North Korea, Mr Moon served in South Korea's special forces before becoming a human rights lawyer. Advocates greater dialogue with the North while maintaining pressure and sanctions, in ontrast to his predecessor. Jailed while a student in the 1970s for leading protests against military ruler Park Chung-hee, Ms Park's father. 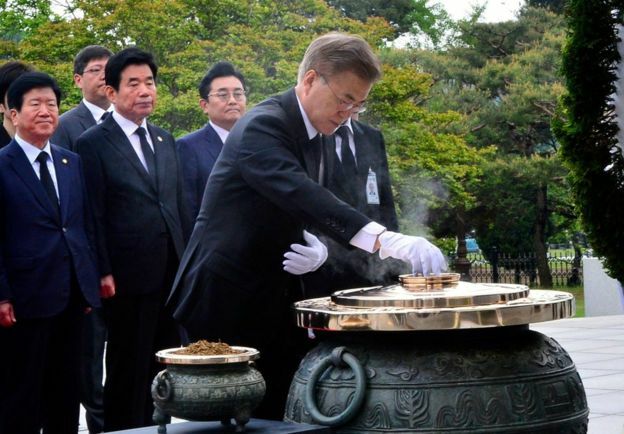 He was a top aide to former liberal President Roh Moo-hyun. Mr Moon's leadership will be closely watched amid high tensions in the region. The US and North Korea have traded angry rhetoric in recent weeks, as Pyongyang has carried out repeated missile tests. The US, South Korea's most important ally, has congratulated the new president. White House press secretary Sean Spicer said the US looked forward to continuing to "strengthen the alliance" and "deepen the enduring friendship and partnership". Japanese Prime Minister Shinzo Abe said their countries faced common challenges "led by responses to the North Korean issue" but they could "further contribute to peace and prosperity of the region by working together". President Xi Jinping said he "always attaches great importance to the relationship between China and South Korea", and that he was "willing to diligently work with" with Mr Moon to ensure both countries benefit, reported Chinese state news agency Xinhua. North Korea had previously hinted that Mr Moon was their preferred candidate, but has yet to issue an official response to his victory. Final results show Mr Moon took 41.1% of the vote on Tuesday, while conservative candidate Hong Joon-pyo took 25.5%. Centrist Ahn Cheol-soo, widely seen as a strong contender, came third with 21.4%.